There are so many places we drive by everyday without giving them a second thought. My commute is the exception—45 minutes, all highways—but Julie’s is more typical. She travels less than five miles daily from Wyomissing to Sinking Spring, but she drives past more than 10 restaurants. 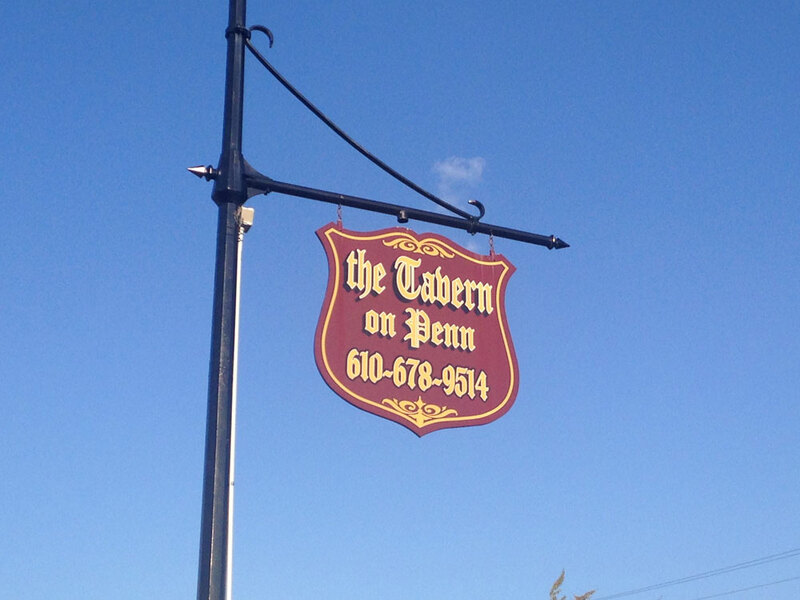 One of those along her route is the Tavern on Penn in West Lawn. But after three years of passing it by, Julie suggested we check it out. The Tavern on Penn opened in February of 2012 in what was once the Penn Cecil Hotel. The hotel had closed a decade before, but looking inside the restaurant, you’d never known it had sat vacant for more than 10 years. The Tavern is split into three distinct areas: the dining room is a mostly sterile room with high ceilings a flat screen on one wall. The bar area pops with a beautiful wooden bar, large mirror along the wall and seating for 20. Finally there is the outdoor patio, where a handful of lucky diners can enjoy their meals in the open air. We had hoped to sit outside, but everyone on the patio was enjoying the cool summer evening and in no hurry to leave. So Julie and I, along with our friend Nicole, grabbed a table at the far end of the dining room. Every time I go to a place labeled a “tavern” or “bar,” I expect typical pub food, but they always seem to deliver so much more. Creativity thrives in these joints, and the Tavern on Penn is no exception. Take our appetizer, for example. 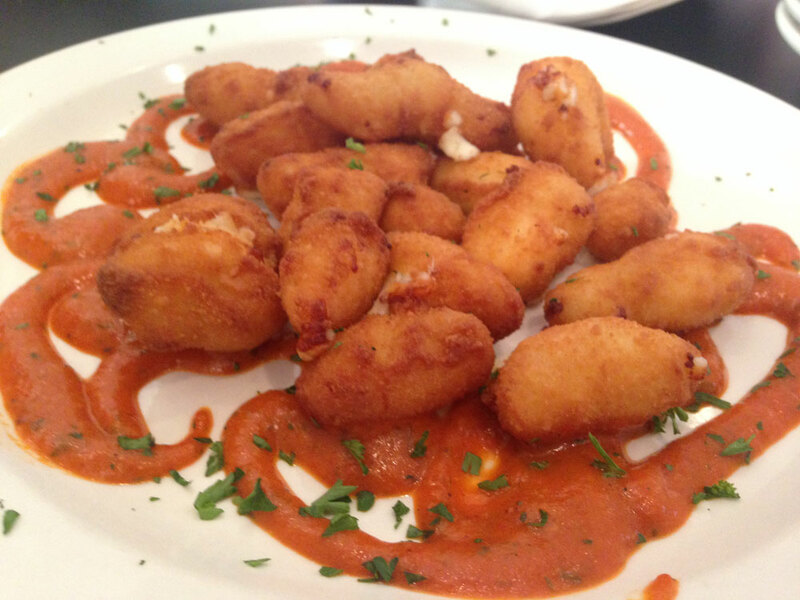 Fried cheese curds is not something you see on many menus, and it’s even more rare with a roasted red pepper dipping sauce. Mozzarella sticks are expected. Fried cheese curds are pleasantly unexpected. Though similar in taste, cheese curds are much smaller, bite-sized pieces. And as a lover of roasted red peppers, I thought the sauce was outstanding. It was like marinara, but with a red pepper base instead of tomatoes, giving it a very different flavor. Among the traditional bar food on the Tavern’s menu are burgers. A lot of restaurants offer a handful of burgers to choose from, but the Tavern on Penn just has two options. One is a build-your-own with 20 different toppings to choose from (all at additional cost). The other is the Penn Avenue Burger. 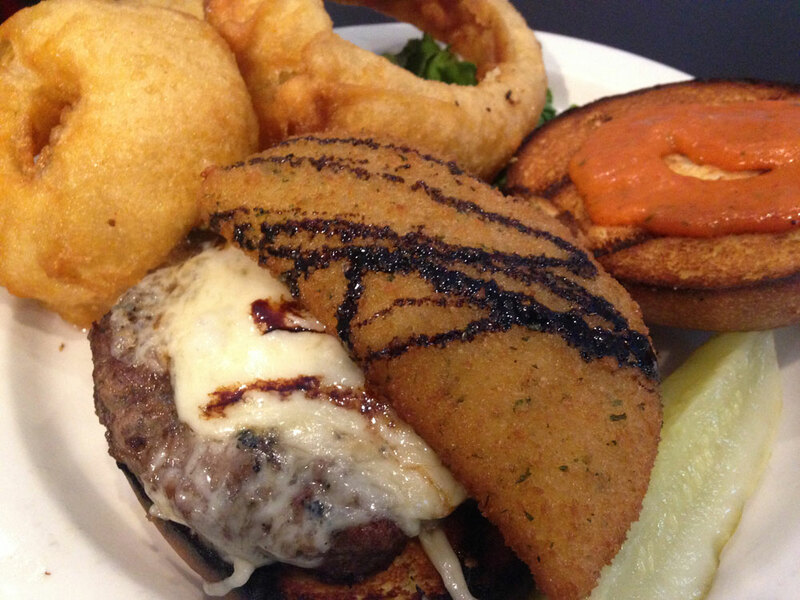 The Penn Avenue Burger comes on a brioche bun and is topped with provolone, a mozzarella half-moon (a crescent-shaped, deep-fried mozzarella stick), roasted red pepper pesto (the same as our early dipping sauce), and balsamic reduction. Burgers at the Tavern begin with a mix of ground chuck and beef brisket, and you can taste the difference immediately. It’s a much more flavorful meat to start. The red pepper pesto mixed with the mozzarella worked just as well on the burger as it did in the app. Along with my burger, I upgraded to a side of beer-battered onion rings. There were only three of them, but it felt like seven or eight as two of them were big enough to encircle my burger. They were very good, a little wet from the fryer, and there was no mistaking that they were beer battered. The sandwich board featured more typical offerings, but with a unique twist. Julie’s crispy chicken chipotle fell into this category. 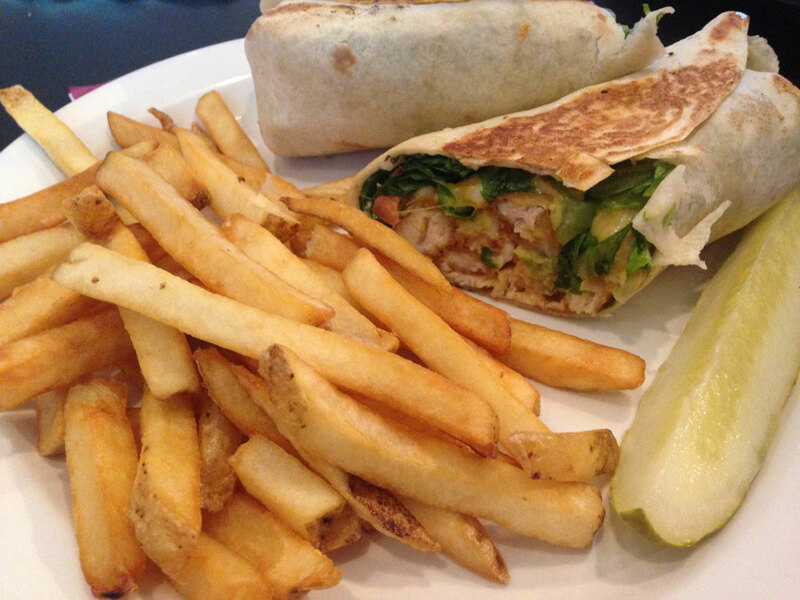 Served as a wrap, it featured chicken fingers, lettuce, tomato, avocado, cheddar jack and chipotle aioli. It was a little spicy, but not too much (the avocado helped cool it off a little). It wasn’t quite as crispy as expected, only because the tasty chipotle had made the breading a little wetter. Still, it was a great sandwich. One disappointing thing was that Julie had upgraded to fries instead of the house made tortilla chips and salsa, which I wished I could have tried. 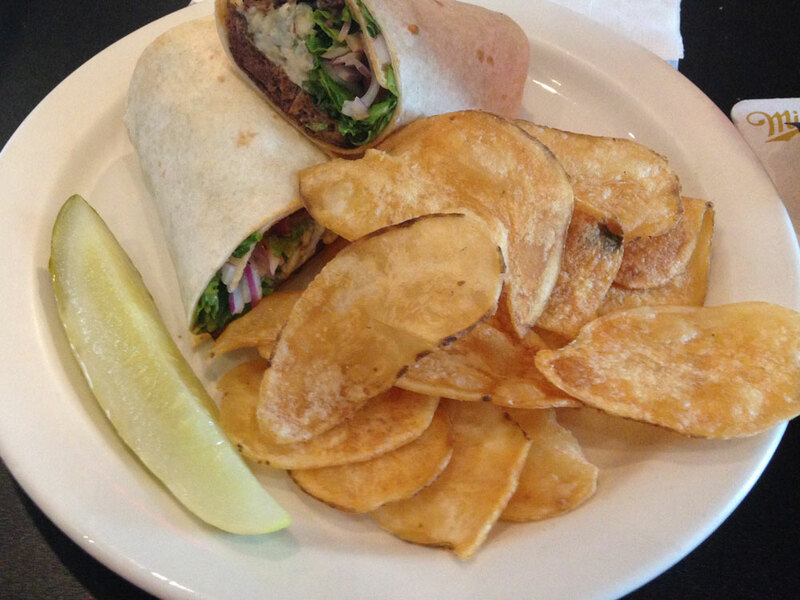 Fortunately, we did get to taste the Tavern’s homemade potato chips, as Nicole got those with her buffalo steak wrap. The chips were served warm, fresh from the fryer. If they were sitting in front of me, I would have snacked on them all night. The three of us polished off $51 worth of food (less than $15 per person, plus our $8 appetizer). I can speak for all of us when I say we could not have eaten another bite. After passing it by for three years, our first trip to the Tavern on Penn did not disappoint. It delivered a memorable meal that ranks among the best that I’ve had this year. I would say that it was certainly worth stopping. Thanks for reading the blog. Sorry you don’t enjoy the Penn Ave chips. All I can say is that the batch we had were good, and I can only write about my experience.